Christmas is such a special holiday filled with traditions and memories. 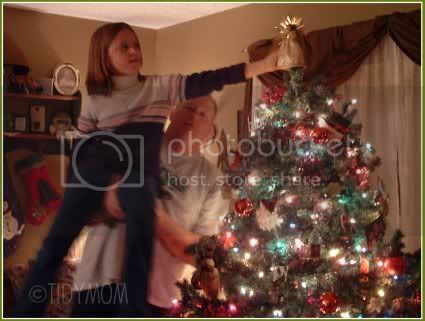 Putting up the Christmas tree, always brings back memories of Christmas’ past. Like the year my husband cut down a tree off a friends property, it was a nice big tree and FREE!…….It was big alright, when we got it into the house it’s branches stretched across more than half of or family room! It just wasn’t going to work, and taking it back out of the house proved even more difficult! We still laugh about that tree to this day! Which is probably one of the reasons we no longer get a real tree. This was our FIRST Christmas tree, our first Christmas we were married, and our only Christmas that we were not parents. Each year the same angel is placed atop the tree. Santa wraps gifts at our house, and each girl has her own Santa paper. One is green the other is red, that’s how they know who’s gifts belong to who. For many years we went to my parents house for Christmas, and as we would get out of the car, their door would open wide and Bruce Springsteen would be singing Santa Claus is Coming to Town so loudly over their Bose system, I’m sure the neighbors could all hear it! That song is STILL my girls favorite Christmas song. Every year the grand kids would assemble, awaiting their stockings and gifts from Grandma and Grandpa. Look at the look of excitement on my nieces face! Of course we have the tradition of taking pictures, you know the kind…….. 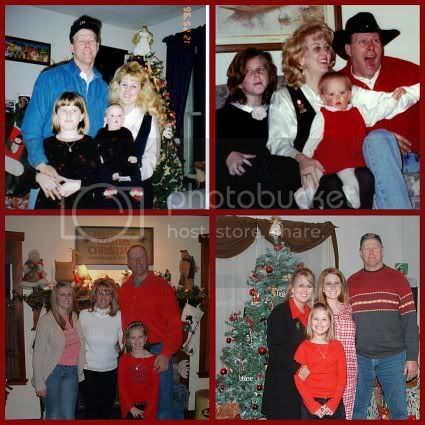 These pictures are VERY special to me……..
My Dad passed away from lung cancer just a few weeks after these pictures were taken. As silly as taking all of those pictures may seem some times, I’m SO thankful I take them. 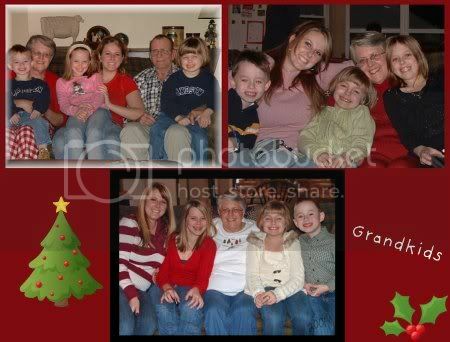 There is also a picture with the grand kids every Christmas. Milk and cookies are still set out on Christmas Eve for Santa, along with a carrot or two for the reindeer. and have started some new traditions, like shopping together on Black Friday, and this will be the second year that Hollywood will host Christmas Eve at her house! It would be wonderful to hear about some of your Holiday memories and traditions ! If you don’t have a blog, tell me about them in the comments! Please feel free to link up below so that we can all see your Christmas Memories and Traditions . The linky will be up thru Monday! 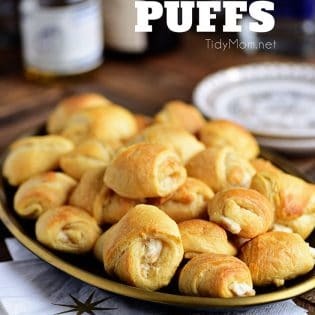 Don’t forget that if you link up on this post you’ll be entered to win some fun prizes over at Simply Sweet Home. Hope you join us! 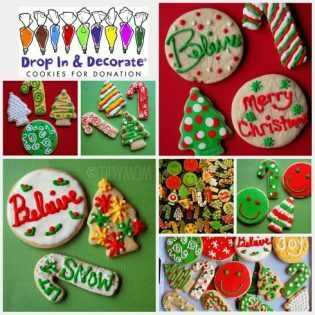 Find more holiday posts at The Inspired Room’s Holiday Linky Friday. Such sweet pictures, Cheryl! Thanks so much for sharing them. I love the idea of each kid having their own color of wrapping paper. I can imagine that that made handing out gifts much easier. I think I might have to start doing that too as our family grows. What fun pictures! I hope my link is okay, I had planned on linking another post but my pictures are not cooperating with me 🙂 And you left a comment on the pie, so I thought it might be okay. Thanks for hosting! It's been a fun week! I just adore all the old photos! 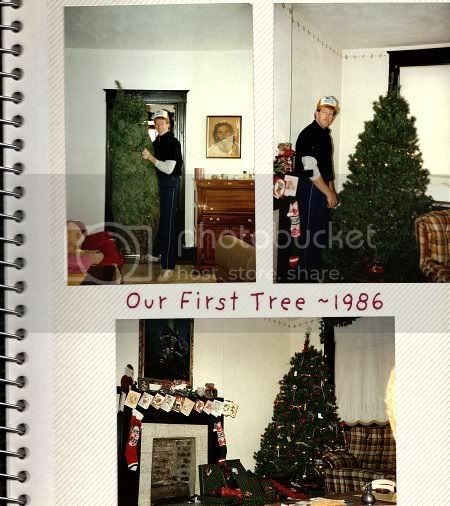 Your hubby looks sooooo PROUD of your first Christmas tree in that first photo! As I write this…I can barely believe that I'm not going HOME for Christmas this year. My first Christmas EVER not to wake up at my parent's farm in Alabama. I don't know why…but I am having a sad moment…this very moment! All of your photos from over the years are just so classic! So like all of ours. And the HAIR…Oh the hair…goes through so many changes…we did like it BIG and POOFY back in those 80's! And your Daddy…your dear sweet Daddy. Life is just so fragile. I know you are creating lovely memories and traditions during this special season for your family…just think…in 20 years…your daughter may be blogging about the same memories that were created when she was growing up…like BLACK FRIDAY!! Thanks for inviting me to join in on the fun! What memories and pictures to cherish! Photos are very precious. I have some pictures of myself and my sister with my mom shortly before she passed. They are very dear to me. Thank you for sharing your special memories through pictures. Thank you so much for sharing your wonderful traditions and memories… and for hosting today! I, too, cherish all my pictures. 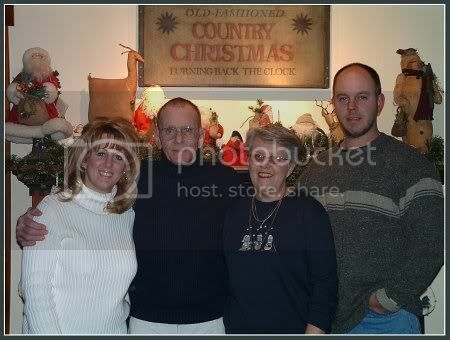 I have a picture of my mom, dad, brother, and myself maybe a year before my mom passed away from lung cancer and it is very precious to me. Geez, I have a feeling looking through people's posts is going to make me cry today!! Don't you just love all the fun fashions and styles. Thanks for sharing your Christmas photos. Oh, Cheryl! You are making me cry! What great memories and sweet pictures of your dad. 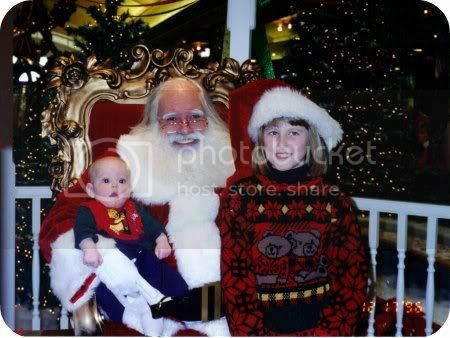 We spent my mom's last Christmas…10 years ago…in New York City. My mom had always wanted to go and to see the Rockettes, so my dad flew us all there. It was very bittersweet because she was pretty sick. She died 2 months later. I miss her. I know you miss your dad, too. My sister & I always had matching pajamas on Christmas morning. 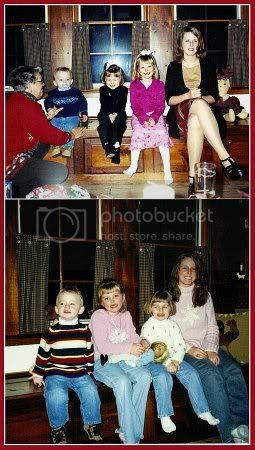 🙂 And, despite my mom being a good cook, we always had Sara Lee Butter Streusel Coffee Cake Christmas morning. 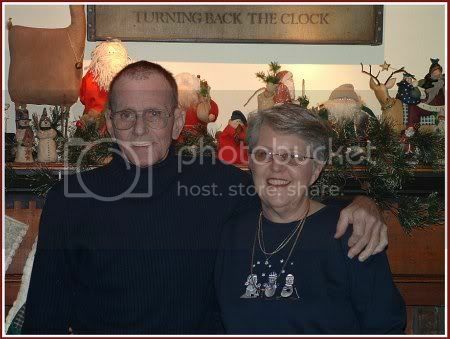 The first Christmas they spent with us, I told her I planned to make coffee cake from scratch. That didn't go over well. I was running to the store on Christmas Eve to buy that darn Sara Lee one! Well, duh, I'm not quite sure why I didn't think about my Pez Tree when I linked up my Pie. So I've added it. Those are very special memories, thank you for sharing them. And, the pictures are wonderful – I know all pictures of my father are special, but the ones of our last Christmas together, are especially so. Lovely and wonderful traditions…we do the thing with ornaments my children look forward to their new ornament as much as gifts…you have a beautiful family! Wonderful memories and treasured photos ~ thanks for sharing these special moments with all of us. I adore that one of your hubs lifting your daughter up to top the tree. So precious! What a sweet stroll down memory lane!! Your family is just beautiful! Cheryl you are so right…those pictures taken in a snap sometime turn out to be family treasures. I love seeing all your traditions and your beautiful family. I couldn't leave a message on the post you left for my party last week but at least I got to see all of this as well. Thanks for all your great posts and I love your decor one tree and all.